What privileges come with the 39AHC / Club 39 Lifetime Membership? Hahaha … oh, sorry. I love comic relief. Please know that *Club 39 membership is strictly in fun. Make no mistake, your membership IS official – the cards are numbered and proprietary. However, this is the BEST club you will ever join. Through it, a global connection to like-minded people is enjoyed. Not only does it proclaim you’re forever youthful, but obligations are non-existent and privileges are your wit and att-i-tude! o Yes! A Forever Young Attitude is expected! *What is the difference between "39 and Holding Club" and "Club 39"? Do we require a full birthdate? How do you know our payment portal is safe? - PayPal is as safe as it gets on the Internet; I trust them to do right by both of us. Your payment is processed through PayPal and subject to their privacy and security policies. At no time is 39AHC privy to your payment information. Once you order how long will it take to receive your 39AHC / Club 39 Lifetime Membership card? - Generally, it ships within three business days, via USPS/First Class mail. So order according to your estimated arrival from California; especially as a gift. - Your exclusive Club 39 Lifetime Membership card is individually produced and comes with a handy, official Club 39 / 39 and Holding Club Tyvek cardholder. - Membership includes a fun welcoming greeting card! - If a gift for someone else, it will be mailed to the address** you provide with a free greeting card in your name. o **If gift membership is not shipped to the person whose name is on the card, please provide their city and state, so we may include in our state-by-state membership list. 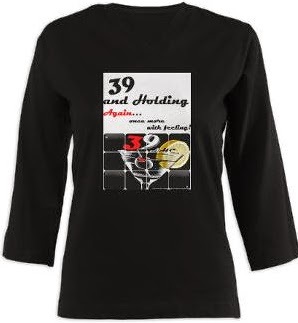 Is that all there is to 39AHC / Club 39? - Oh heavens no … check out our Café Press gift shop! Club 39 Nifty Gifts. And, our big bro site, Blast from Your Past, about Rock& Roll Radio of the 1950s – 1970s. Rock on! - And who knows ... once I finish my current book, I could develop this site and the 39 and Holding brand the way it deserves. Have any ideas?